The Camino de Santiago is a large network of paths converging from across Europe at Santiago de Compostela. Some general information on the many types of terrain encountered on the more popular routes is included below. The Le Puy Camino France or Via Podiensis extends approximately 690 km across southwest France to the French-Spanish border and is famous for its beautiful terrain and architecture. The route begins in the high plateaus of the Massif Central which involves steep climbs through woodland and villages. After leaving the Massif Central, the route includes long walks through agricultural land, open grassland, and vineyards and along rivers and canals. In the French Basque region, the terrain becomes mountainous upon approaching the Pyrenees and the start of the Camino Frances. 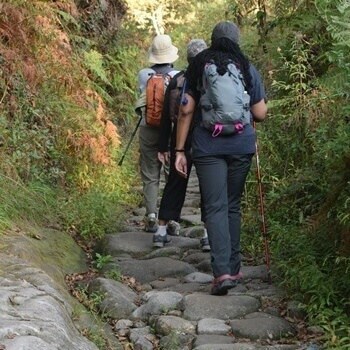 Although this walk contains long stretches of easy walks, the rugged, mountainous regions with long, steep climbs and descents make it a challenging but rewarding walk. The Camino Frances or the French Way is the classic Camino and stretches approximately 780 km across northern Spain. It begins with a strenuous hike over the foothills of the Pyrenees. From there it follows hilly, woodland paths and winds through the fields, villages, and towns of Navarra and Rioja. The route then climbs to the high plateau of the Meseta in Castille and Leon. Here the exposed, treeless route consists of long stretches of nearly flat dirt or gravel paths through sparsely populated agricultural land. This area also contains long walks through the beautiful cities of Burgos and Leon. After leaving the Meseta, the route crosses the Montes de Leon into Galicia. 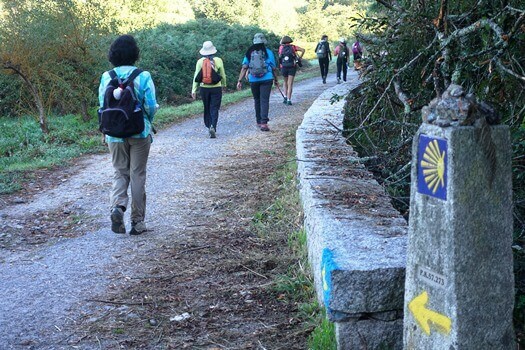 The path through Galicia includes steep, rocky ascents and descents, open upland, wooded paths, and small rural roads through pastures and villages. Rural tranquility yields to excitement with a sweeping descent by road into Santiago. The Camino Norte or the Northern Way is a 465 km world of extremes. The first section extends from San Sebastian to Bilbao in the Basque Country. It takes in many types of terrain including grassy fields, rolling hills, country lanes, coastlines, forests, villages, and jagged mountains. After leaving the city and suburbs of Bilbao the terrain becomes less strenuous but still dramatic. The paths wind along coastal cliffs, occasional steep hills, and flat walks along marshland and beaches before reaching Santander. After Santander the route meanders through meadows and villages and along the wild Cantabrian and Asturian coast. The route then heads inland to Oviedo and the start of the Camino Primitivo. The approximately 330 km Camino Primitivo or Original Way begins in hilly farmland and villages before crossing the Cantabrian Mountains. This challenging section is wild, wooded, and sparsely populated with long ascents and descents on roads and paths. 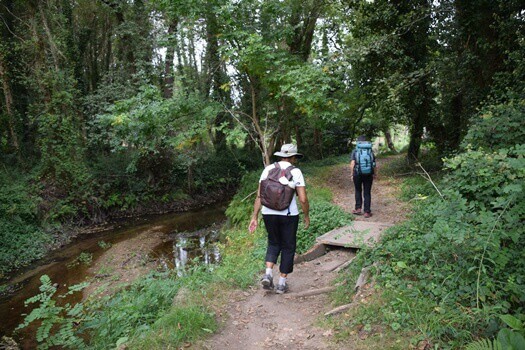 As the route descends from Asturias into Galicia, walking becomes easier with a return to farmland, villages, towns, and forests. The Primitivo joins the Camino Frances in Melide, about 40 km from Santiago. From there it consists of forest tracks, villages, and quiet country roads before entering the more developed environs of Santiago. The nearly 1000 km Via de la Plata is a land of extremes with an unparalleled variety in types of terrain. 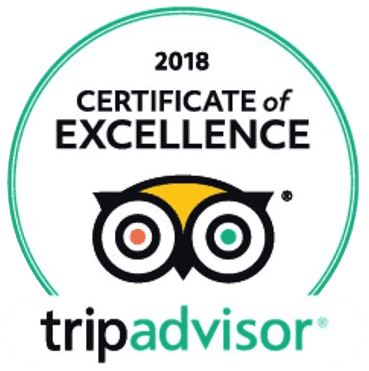 After starting in urban Andalucia, the route quickly gains elevation and enters into the dry, rocky parks and agricultural land of Extremadura. Here the path follows dusty tracks and remnants of Roman roads over mountains and across large areas of sparsely populated high plateau. The terrain here is exposed with little shade. Upon descending the plateau and entering Castille y Leon, the landscape becomes greener with more frequent towns and villages. 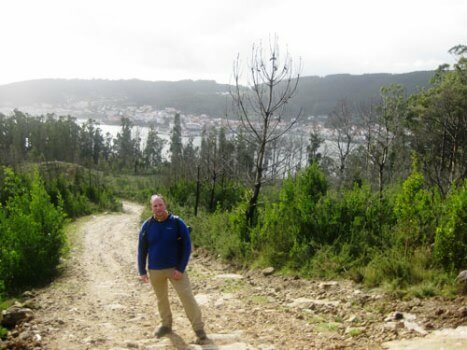 The terrain is also more challenging with steep climbs and descents upon entering Galicia. This is “green Spain” with its forests, fields, and mountain villages. Here is a lush mix of everything from shady paths to quiet, country roads to national roads ushering you into Santiago. 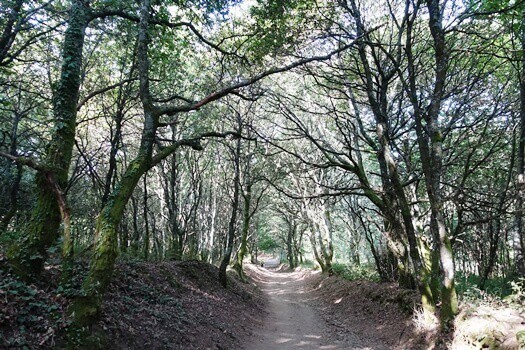 The Camino Ingles or the English Way from Ferrol is a short route of only 119 km and lies entirely within the green, misty land of Galicia. However, it has variable types of terrain ranging from hilly coastlines and estuaries near Ferrol to steep climbs into the mountains on gravel and dirt paths. The wooded mountains and villages then give way to paved paths on the outskirts of Santiago. The 600 km Camino Portuguese or Portuguese Central Way begins at low elevation in Lisbon with easy walks through river valleys. It then enters first hilly and then more mountainous terrain as it approaches Porto. The route here consists of everything from wooded paths to Roman roads to urban pavement. Once the route leaves the nearly flat Atlantic region north of Porto, it enters the hillier and greener lands of northern Portugal and Galicia. Here the route consists of gently undulating woodlands and agricultural regions with cobbled country roads and dirt tracks. The steeper slopes and rural villages of Galicia provide a verdant landscape as one approaches the city of Santiago. The types of terrain on the 240 km Camino Portuguese Coastal are a contrast to those found on other routes. The route leaving Porto is nearly flat with only occasional small hills. 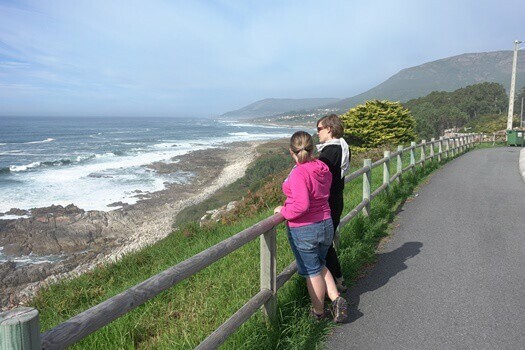 The walk along the coast is a mix of paved footpaths through towns, forest tracks, and cobbled country roads. It’s also possible to walk along miles of pristine beach or long stretches of wooden boardwalks within the sand dunes. Once in Spain, the gently undulating route follows the coast northwards before turning inland and becoming increasingly hilly. The Coastal Route joins the Portuguese Central Way at Redondela. From there it meanders through the green hills of Galicia to Santiago. The 89 km route to Finisterre consists of long walks along dirt tracks and quiet, paved country roads through occasional small villages. The path through this green, undulating terrain makes a final big descent to the Atlantic at Cee. After climbing up and down one more headland, Finisterre is in sight. It’s then a short 3 km road walk from the town to the lighthouse at Cabo Finisterre to watch the sunset. 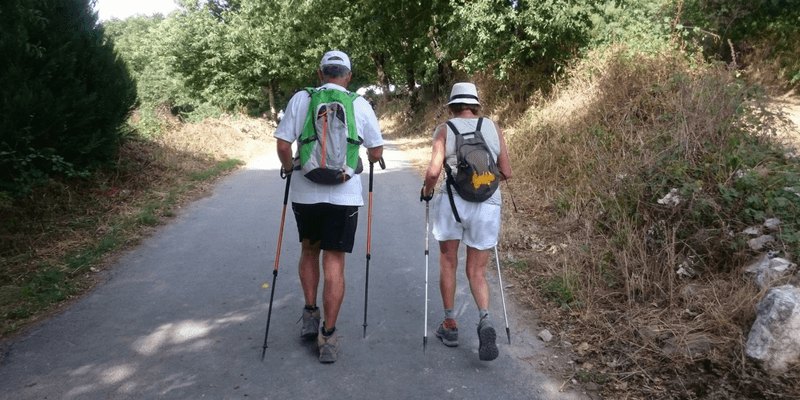 One each of the routes in to Santiago you will encounter different types of terrain on each day or so, we have given you an over-view here but we highly recommend you take both a light and heavier walking shoe with you for your Camino journey.